French cuff shirts may be the minority in men's fashion, but it is a stylish and well-thought-of minority. Wearing French cuffs is a bold statement of a man's own fashion identity. French cuff shirts were originally a mark of more formal wear, only appropriate when also wearing a suit and tie. However, as times change, so does fashion, and modern men's attire has seen them appear not only without a suitcoat but even without a tie. There seems to be a definite sense of "ease vs. style" when making this kind of choice. A button cuff is much easier to wear - no folding of sleeves or cufflinks getting lost. However, the fashion statement that a French cuff makes about a man is worth it, and will tend to set a man apart from the majority of his fellows. It also gives an additional accessory to the ensemble, in the form of cufflinks. This added form of expression makes the French cuff more and more popular. Because they aren't that common, many men don't actually know how to wear French cuff shirts - they try them on, see the floppy sleeves that extend well past their hands, and assume the shirt must not fit! In reality, that extra-long sleeve has four tiny slits - like button holes - in it, and the sleeve is meant to fold back over the wrist so that the two sets of holes match up. At this point the cuffs will be the appropriate length - but they need to be held together, with all four holes in line. The inside of the cuff should be pushed together (not overlapping, the way button cuffs do) and the cufflink pushed through the hole. Some men have trouble manipulating the tiny stem of the cufflink through the four layers of material, but practice makes perfect. 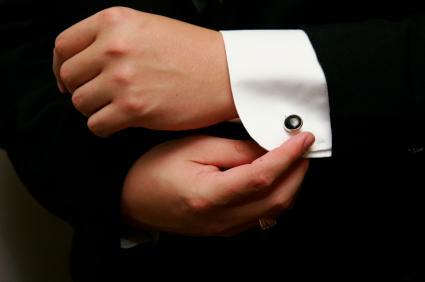 Since the sleeves are usually bigger in diameter than button cuff sleeves, it may also be possible to put in the cufflinks first and then slip the arm through the sleeve. There is a wide variety of cufflink styles to choose from. The most common used in the U.S. has a "stud" on one side - which may be a simple sterling silver square, some tiny sculpture, or a symbol of some affiliation such as Freemasons or the military. The other side has a small "toggle" - a post that is vertical when pushed through the cuffs and then rotates to hold the cufflink in place.In Europe, double-sided cufflinks are common, but they are also harder to put on than the "toggle" style. Either way, cufflinks should be chosen to match either the necktie and shirt (if colorful) or the belt and watch (if metal). There is also the option to use "silk knots" - tiny knots called "monkey's fists" that some use as an alternative to the small, easily lost pieces of metal. Whatever your favorite type of cufflink, it's a good idea to take them with you when you go shopping for shirts with a french cuff - that way you can be sure they will both function well and look good. There are as many different styles of shirts with French cuffs as any other shirt - from the loud, splashy fabrics showcased by Brad Pitt in Ocean's Eleven to the sophisticated look popularized by the TV show Mad Men. This style of cuff can be appropriate in just about any setting where a button-down long sleeved shirt is called for, but be aware that you are making a statement about your style by wearing it. Some might consider the French cuff to be somewhat pretentious. Mid-to-high-end men's clothing stores would have French cuff styles in their inventory, but in the U.S. they may be harder to find - Men's Wearhouse, for example, has a very limited stock on hand. Amazon and other online retailers like Paul Fredrick have a wider selection, but you need to be very clear on your measurements and be prepared to send back a shirt that doesn't meet your needs. Like most clothing, it's always best to purchase from a place where you can try on the clothes before you head out to set the style yourself.